My version of boho chic. This weekend the winds were crazy! I was supposed to go skydiving with my mom on Saturday but the winds were so bad that it got canceled. I was super scared about jumping and actually very relieved that I had at least one more day to live. I figured since it could be my last full day on earth I might as well look cute! I met up with my mom for breakfast in the valley, it was super windy but almost 90 degrees out! This outfit was perfection. The flower crown (which I make and sell on my site here) kept my locks from flying all over the place and I brought a super light cardigan because when the winds would get to kickin' it was actually pretty chilly. 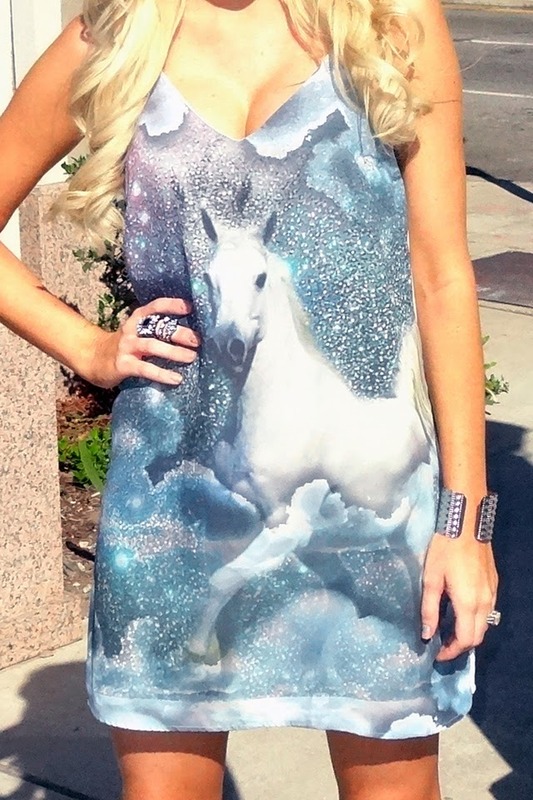 The amazing unicorn dress I'm wearing is my latest obsession! I guess it's not even an actual unicorn but it kinda looks like one and definitely has the same magical vibe of a unicorn. Plus unicorn dress sounds a whole lot better than "magical hornless horse dress"- just sayin. I got all of my accessories on sale. 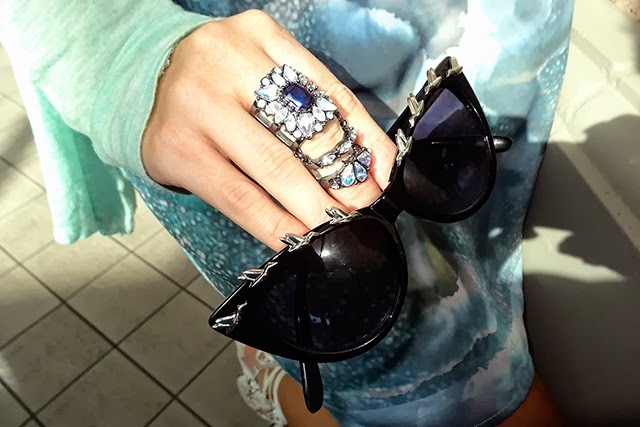 I found this amazing finger length rhinestone ring on the sale rack at H&M two weeks ago. Everything on sale was buy one get one free- twist my arm! So I got this ring and another finger length ring for a total of $5! I love deals! I got these black cat-eye sunglasses from the sale section as well, via Nasty Gal. I thought the bird embellishments were cool and unique and for $8 I thought they made a great addition to my eye wear collection.